The world’s top avocado exporters are Mexico, the Netherlands, and Peru. Mexico has been the global leader since 1994 and represented 50 percent of the world’s exports in 2016. From 2011 to 2016, exports rose 167 percent, and 43 percent from 2014 to 2016. The Netherlands, even though it doesn’t produce avocados, receives shipments and exports to several European countries. For 2016, the value of these exports reached $608 million, representing 11 percent of the total avocado exports in metric tons. From 2011 to 2016, these “re-exports” increased 136 percent, and grew 56 percent from 2014 to 2016. As the third top exporter, Peru’s shipments were valued at $396 million in 2016. Peruvian exports have surpassed Chile, beginning back in since 2013 in the midst of continued growth. From 2011 to 2016, avocado sales to foreign markets rose by 138 percent. However, from 2014 to 2016, such sales grew only 8 percent due to flooding in growing regions. Other up-and-coming export countries include Colombia and the Dominican Republic. 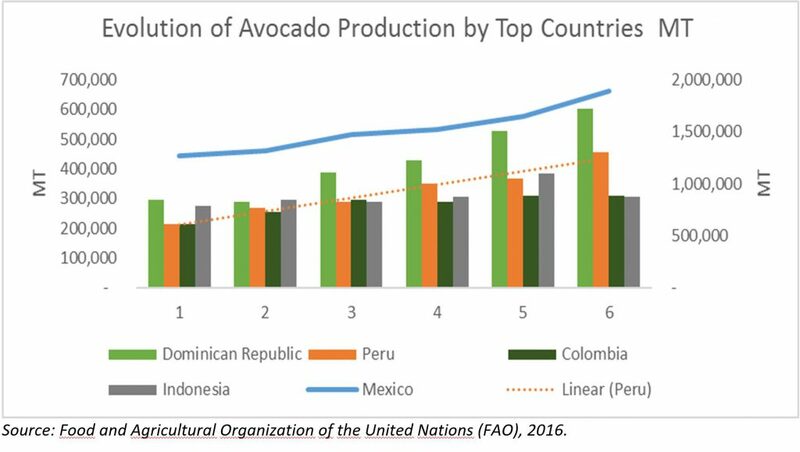 The top export destination of Mexican avocados is, as mentioned previously, the United States (with 75 percent of total exports). The rest are sent to Europe, Central America, and China. Peru and Chile export mainly to the Netherlands; in 2016, Peru shipped 41 percent and Chile shipped 39 percent to the Netherlands. Each also exports to the U.S. market: Peru sent 28 percent of production and Chile 27 percent in 2016, with Peru reserving 1 percent and Chile 12 percent of exports to China for the year. The U.S. avocado market is served by both imports and domestic production. California is the top supplier of Hass avocados, and Florida produces green-skinned varieties. To keep the country well supplied, Mexico exports avocados all year, with peaks in the months of December and January, and the least in June and July. Mexico’s production cycle contrasts with U.S. supply, with domestic high production occurring from April to July, with imports from Peru, Chile, and the Dominican Republic augmenting supply. Peru supplies the U.S. market from May to August, and both Chile and the Dominican Republic from of October to April. This provides a window opportunity for Peruvian and U.S. producers to earn higher prices in the U.S. market from June to August, when Mexican production is low. The majority of avocados consumed in the United States are transported by truck from Mexico and California, which represents 90 percent of total supply. The rest is transported from Peru and Chile by boat (at 9 percent), and by air (at 1 percent).